carlyklock: My Birthday 'Cake': Strawberry Chiffon Pie! My Birthday 'Cake': Strawberry Chiffon Pie! I love strawberries. Just looking at these pictures of strawberries makes me so happy. It may have something to do with the fact that strawberries signify summer, and with spring blowing into town this past week, summer is finally on the horizon. ...Which makes me so happy. 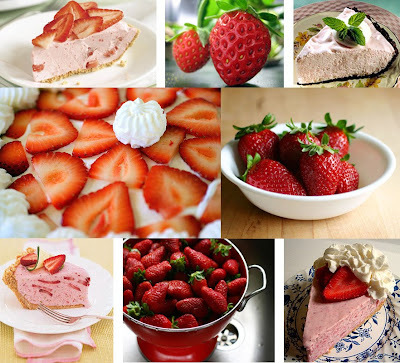 Strawberry Chiffon Pie has been my birthday 'cake' ever since I can remember. I'm a June baby, so strawberries are in season, and this pie is so light and airy you can enjoy it no matter how smouldering the weather. Digging through my recipes to find this one, I realized I have so many of my mother's recipes yet to share with you! I'm going to make this pie this weekend for our Easter feast (the first time I've ever had it other than my birthday). I thought seriously about doubling the recipe and making bars instead - The Stallion's family gathering would definitely warrant double the goodness. What a great idea! But then I found all these beautiful pictures of strawberry pie and decided I shouldn't mess with a good thing. So, pie it is. You can make this with a pastry pie crust or a chocolate crust. Or even a graham cracker crust would be divine. Me? Chocolate. Always. When I was a kid, I'd get upset when my mother would make the crust out of chocolate wafers instead of Oreo cookies. Mainly because I loved the annual chance to get Oreo cookies into our house and save a few from a trip to the food processor. But you know what? Chocolate wafers make a much better crust. Preheat oven to 325°F. Place the cookies in a food processor and process until finely ground. Leaving the processor on, gradually add the butter. Place the cookie-crumb mixture in a 9in pie plate and, using your fingers, press the mixture firmly and evenly into the bottom and up the sides. Bake for 10 minutes, then remove to a wire cooling rack while you make the filling. Bring strawberries, water, sugar, lemon juice, and gelatin to a boil. Separately, dissolve cornstarch in water and add to strawberry mixture. Bring to a boil again and cook until thick. Remove from heat. Beat egg whites and sugar until stiff and fold into the hot mixture. Pour into the pie shell and refrigerate 3-4 hours before serving. Serve it up with some fresh whipped cream and sliced strawberries. And a mint leaf for garnish.